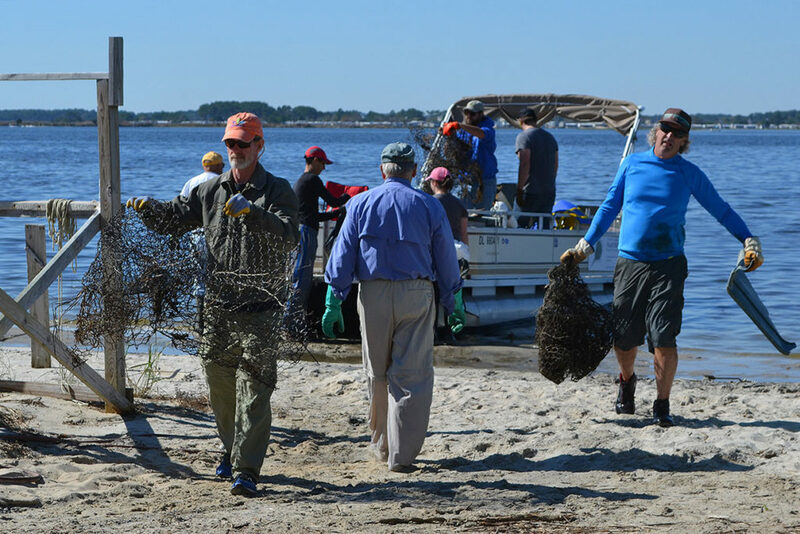 Rehoboth Beach – On October 18th, volunteers from Century Engineering, Coastal Kayak and the Delaware Center for the Inland Bays participated in an on-water clean-up in Little Assawoman Bay, collecting 1.35 tons of marine trash. 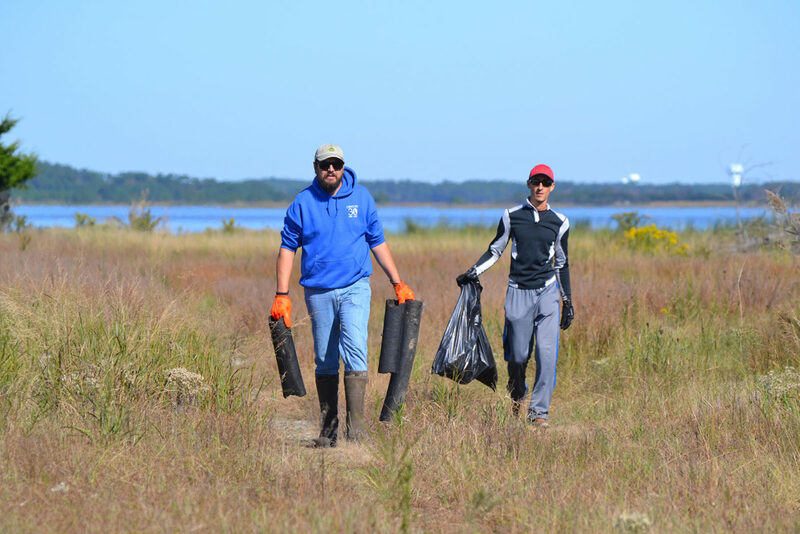 For hours, these dedicated volunteers scoured the marshes and shorelines of Little Assawoman Bay: the smallest and southern-most Bay in Delaware’s Inland Bays watershed. There, they found everything from plastic bottles, aluminum cans and plastic wrappers – to larger pieces like old tires and, overwhelmingly, treated lumber that likely washed into the Bay during flooding events. All together, 1.35 tons (that’s a whopping 2700 pounds!) was collected and disposed of through the Delaware Solid Waste Authority’s Community Clean-Up Initiative. The dumpster used was provided by Waste Industries as part of their Full Circle Project. Volunteers from Coastal Kayak, Century Engineering, Inc. and the Delaware Center for the Inland Bays provided the manual labor for the day. Coastal Kayak is a full service kayak eco-tour, kayak, paddleboard, sailboat and instructional business based in Fenwick Island. Century Engineering, Inc. is a full-service consulting, planning, engineering, surveying and inspection firm with a local branch in Dover, Delaware. Derelict crab pots were among the debris removed from Little Assawoman Bay. Photo features Jim Bourke of Coastal Kayak and CIB Program Manager, Bob Collins. The Delaware Center for the Inland Bays would like to sincerely thank these supporters for their participation, as well as Representative Ron Gray for securing the generous DSWA sponsorship of this event. With these dedicated “friends of the Bays’, Little Assawoman Bay was left a cleaner and safer place for visitors and wildlife alike! Want to help prevent this trash from getting into our environment? We have a few tips for you! Carry a reusable water bottle, take your own cloth shopping bags to the grocery store, choose to buy products with less packaging, switch to reusable cloth snack bags, and ‘just say no’ to plastic straws, utensils, and balloons! 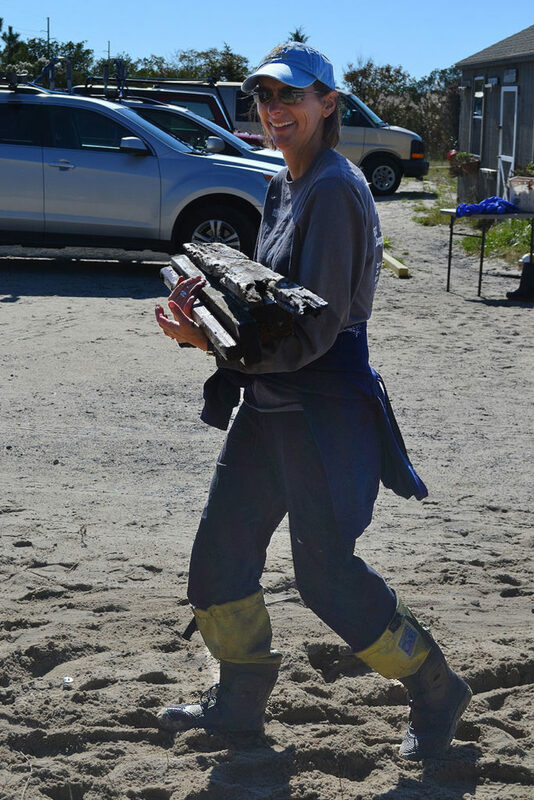 Jenifer Mitchel, a volunteer from Coastal Kayak, carries treated wood off of the boat.